Sorry I haven't posted much this week. I've been working on several projects, but I can't share them just yet. And, in honor of the fact that the 4th of July is coming up, here's a card I did a while ago. I made a scalloped border using buttons. Here are a couple of projects I just finished up. This is a gift box for a new home gift. I thought a little tea towel and a gift card would fit perfectly inside. I painted the key (it's grungeboard) with crackle paint and then inked it. This next card was really simple. 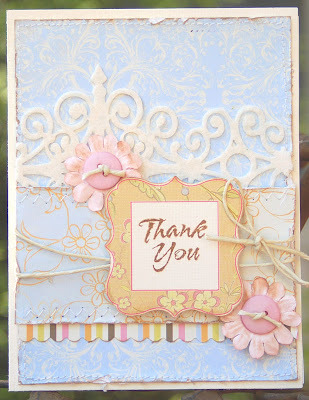 The sentiment came from one of the papers in Raspberry Truffle collection. I cut the top flower to overlay the sentiment. Finally, a layout of our sweet neice Kate. (Click on it to see the details close up. )She just graduated from college and is getting ready to work on her Master's Degree. She just signed a lease on her first apartment. Kate is one of the most amazing women I know. I just adore her and love spending time with her. (She's my bartender. She always finds such fun drink recipes!) Talented, beautiful and the heart of an angel, I just adore this girl. Both of my projects today have blue and green in them. But they are quite different from each other! This first one is the present I gave Fran for Father's Day. Yes, his card and the gift both used the same photo. 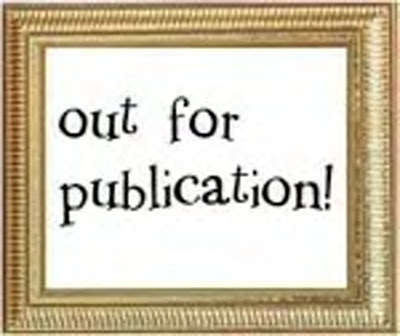 ;) The frame is for his office. I used lots of Making Memories Animal Crackers stuff on here. The stars on the bottom are attached with foam adhesive for a little pop. And this card is my CPS card for the week. I think it's one o fmy new favorites. I just love the Making Memories Passport line. 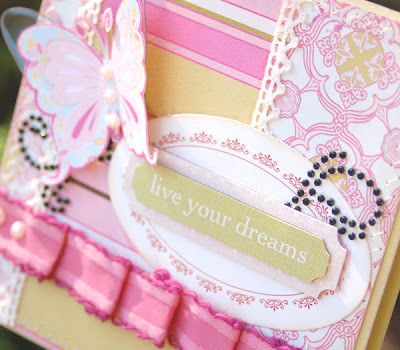 I added lots of bling and some Scenic Route chipboard that I glittered up! The flower is from Prima. Hope you all have a great weekend! I'm so excited to be going to tea with the girls tomorrow and Ryan has a birthday party on Sunday. But I'm definitely going to be doing some creating. Got my box of new release goodies from Pink Paislee and all I can say is OH MY!!!! You are going to die when you see the new lines. They did it again!!! First off, thanks for all of your good wishes from my post below. I really appreciate all of the kind words!! Recently, I had the chance to play with some of the new Scrapblocks from Cornish Heritage Farms. They are 6 by 6 inch squares of red rubber with the most fun patterns on them. I used them on several projects that I want to share with you. 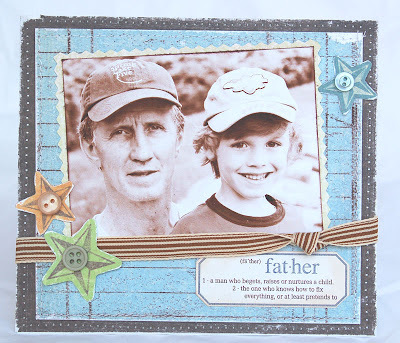 This is the card I gave Fran for Father's Day. I used the Vintage Ledger Scrapblock for the background. The papers and die cuts are Crate Paper. 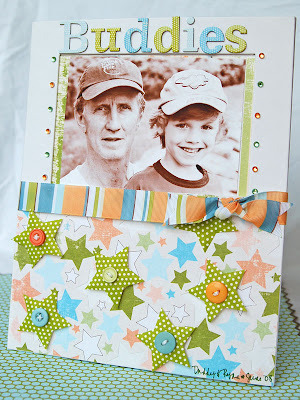 This next card uses the Perfect Plaid Scrapblock. I love the way you can make background papers with these. 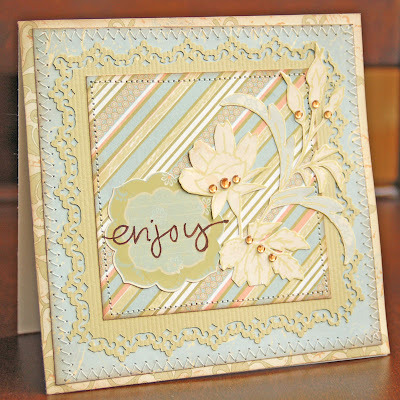 I also used a stamp from Kim Hughes' Fall Silhouette's collection. This last layout cracks me up. Can you believe I'm posting such a scary shot of myself? (OK, I was exhausted...Ryan was 2 weeks old.) Anyway, I used the Writing Paper Scrapblock for the background on here. I used paint to stamp it. It serves two purposes. 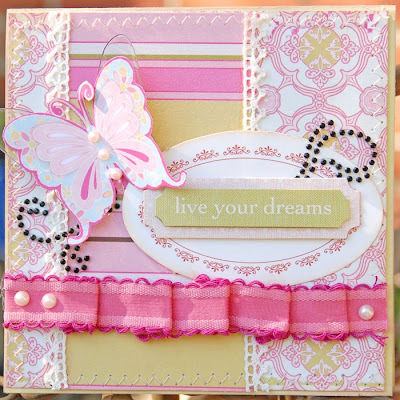 It adds texture behind the main segment of the page and also becomes my journaling box. I wrote about how Ryan inherited the Fly Catcher gene from me. We both sleep with our mouth wide open. Well, that's all for today! Thanks for stopping by! I'm so excited! I was honored to be asked to join the very talented team at Webster's Pages!! If you haven't had time to check out their stuff, you HAVE to. The papers are gorgeous! And they have some really cute rubons and stickers, too. They have set up a great site called InspireMe. You can head over there for tons of inspiration. I received my box of goodies and couldn't wait to get to work. Here are my first three cards. This one uses the Sweet Charity line. I made the frame using a rubon. The felt is Prima and the flowers are MM. This next card uses on of their two Christmas lines. (They are both amazing! )The line is called Winter Wonderland. 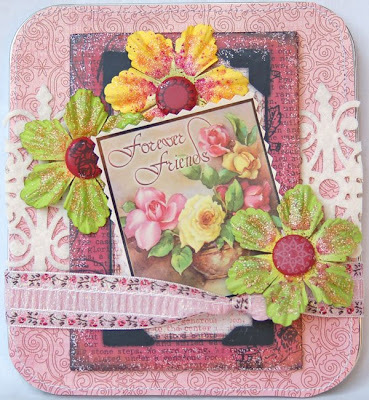 I added a Crafty Secrets cotton scrap with some Stickles, a vintage piece of handwriting paper and some Heidi Swapp chipboard. This last one uses my favorite line (for today at least ;)). It's called Raspberry Truffle. I made a 3-D butterfly and pleated some MM trim. So, that's my exciting news for today. Thanks for letting me share it with you!! And thanks for stopping by. 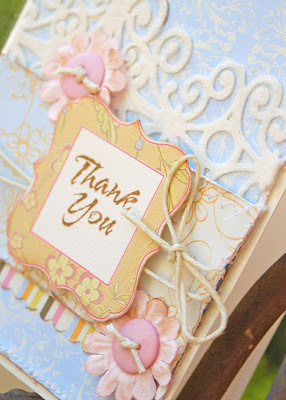 I truly appreciate all of the sweet comments. Queen and Company is hosting a contest! 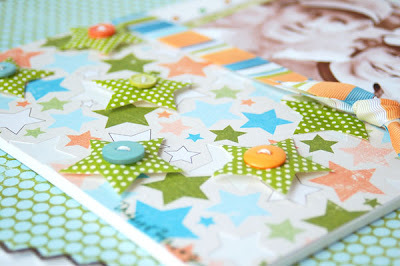 All you need to do is send in a project using Queen and Company products and you could win some of the new mini-felt!!! Check out the details here: contest details. 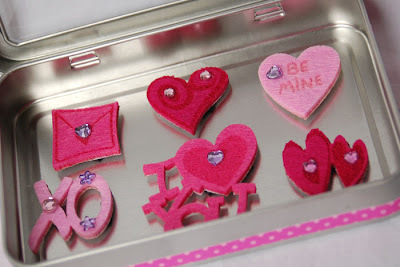 I added some jewels to the magnets and arranged them in this cute window tin. (That can be found at Emma's Paperie). Then I decorated the tin with some Queen and Company felt, ribbon and an SEI tag. I thought it would make a fun teacher gift. There are lots of different Felt Frenzy themes including pets, summer and easter. So the magnets could be given as gifts for a variety of reasons. So, check out the contest and good luck if you enter!!! This week at CPS, we were sponsored by ISC stamps. I have to say that I really liked the stamp images online, but I fell in love with them when they arrived. They are nice and big and the images are gorgeous. 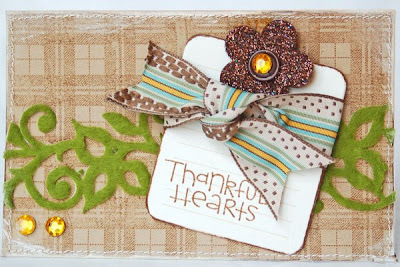 I used the Holidays set to create this card. I stamped the image and then stamped it again. I cut out the tree, added Stickles (both to the tree and to the edges) and then mounted it over the original stamped image. The papers are Basic Grey Figgy Pudding, which I just love. The paper is SEI. The felt and chipboard are Prima. And the flowers, painted with Stickles, are Prima, too. 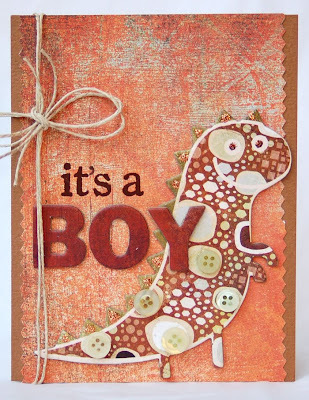 The cute image is from Crafty Secrets. 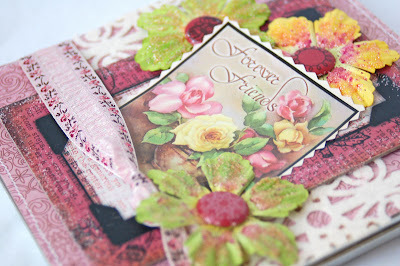 I also used Prima brads for the flower centers and Melissa Frances ribbon. These are my new favorite projects! 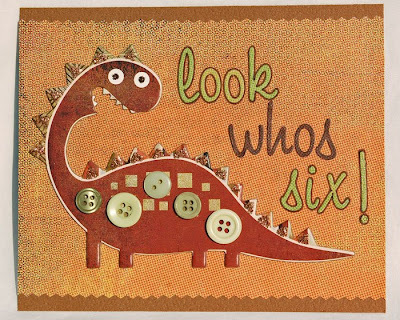 I recently got a pack of Basic Grey Archaic Chipboard shapes from Emma's and I just fell in love with the dinosaurs!! 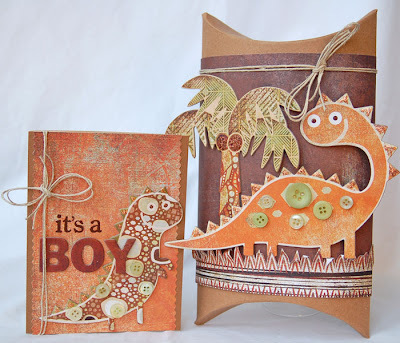 I made this pillow box set and another card because I thought their little faces were just so darn cute. All of the projects use Archaic paper, too. 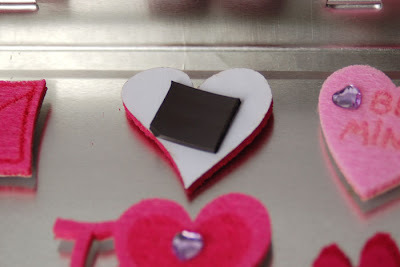 They were so quick and easy to make. 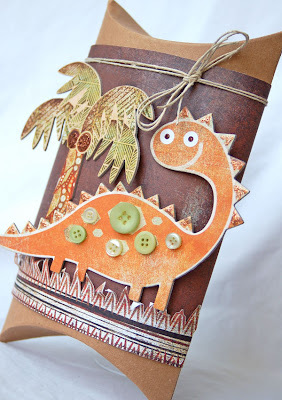 I just added the paper and stuck the dinos right onto it.